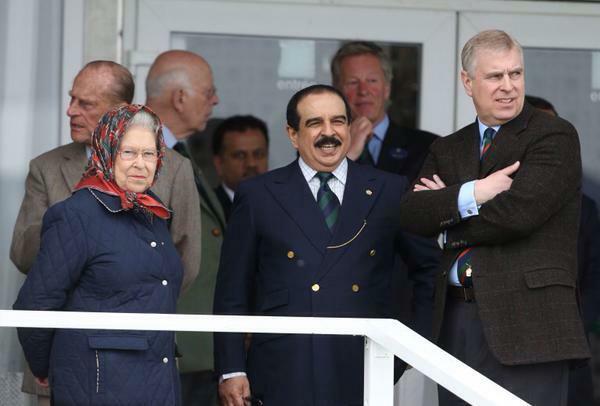 The dictator of Bahrain—who, with the help of Saudi troops and tanks, ruthlessly crushed an Arab Spring uprising that demanded a representative democracy—is spending a leisurely day, today, in Britain, one of the world’s oldest parliamentary ‘democracies’, visiting a horse show with his fellow parasite Queen Elizabeth II. Britain is neck deep in the undemocratic campaign to topple the Syrian government of Bashar al-Assad, amply assisted by Saudi Arabia and other tyrannies of the Persian Gulf, who have provided arms, training and money to al-Qaeda and other Sunni religious fanatics to wage jihad against the secular, anti-sectarian, anti-imperialist, and anti-Zionist government of Assad. Assad must be toppled, the misnamed Friends of Syria aver, because he is a dictator who thwarted an Arab Spring uprising. Sensitive to the legitimate demands inhered in the uprising, the Syrian government made major concessions, amending its constitution to open up political participation, and holding a multi-candidate presidential election, which Assad won. Is Syria a democracy? By Western standards, not yet, concedes Assad. But “if you want to compare me to your closest friend, Saudi Arabia, of course we are democratic,” Assad told a French journalist. “You’re dealing with a regime that is not very credible on weapons of mass destruction programs,” Ford insisted, to lend weight to his case. To be sure, his observation is incontestable, but not in connection with Syria and only insofar as it refers to the “regime” in Washington, which infamously concocted a fiction about Saddam Hussein concealing weapons of mass destruction as a pretext for war on Iraq. The accusations levelled at Syria are no less baseless, Ford’s transparently politically-inspired arguments notwithstanding. The Bahraini king’s hobnobbing with ‘Her Majesty’ calls to mind Diderot’s observation that mankind will never be free until the last king is strangled with the entrails of the last priest, though an updated version would need to include the rulers of the world’s currently dominant socio-political system, along with an expanded definition of priests to include mainstream journalists, think-tank experts and PR hacks, to say nothing of former US ambassadors, labouring to mislead public opinion into accepting yet another war on a country that seeks to chart its own course, free from subservience to the dictates of Washington and its political masters on Wall St..
“Syria,” asserts Assad, “is an independent state working for the interests of its people, rather than making the Syrian people work for the interests of the West.” And therein is the issue. Ford, the New York Times, and other instruments of the Western ruling class, want the Syrian people to work for the interests of Western bankers, high-level corporate executives and major investors, as the Saudis, Bahrainis, and other puppet Arab monarchies do. And they’re willing to lie, deceive the public, do deals with al-Qaeda, and wage wars of aggression, to get their way. Into the Middle East they stride, their hypocrisy going naked, with the new priests scrambling desperately to drape it with pleasing raiment. The New York Times ran an article on May 12 suggesting that the Syrian government has held back some of its chemical weapons and is using them against rebel fighters. Significantly, the allegation was backed by no evidence, yet the newspaper chose to run the story anyway. However, a close reading of the article showed that there was not one whit of evidence to back up the diplomat’s suspicion. Indeed, at various points in the article, the story’s lead was challenged by the journalists themselves. In the same article the reporters refer to “mounting evidence that Mr. Assad’s forces had violated the terms of the international treaty banning use of chemical weapons … by dropping jerry-built chlorine bombs on insurgent-held areas.” The mounting evidence turned out to be the testimony of witnesses who say the bombs have been dropped from government helicopters. However, the quality of the evidence is untested, and virtually useless. There’s no way to determine whether the witnesses are authentic or simply opponents of the Syrian government who have an interest in spreading false allegations. What’s more, there’s a compelling reason to believe that Syrian forces have not engaged in the action they’re accused of. Jerry-built chlorine bombs are capable only of briefly incapacitating a few fighters. Conventional bombs—which the Syrians have in abundance—permanently eliminate many more. Why, then, would Syrian forces risk worldwide condemnation to use an ineffective weapon, when they have more effective weapons at their disposable which world opinion does not condemn? No less fraught is the complicity of Western media in propagating similarly baseless allegations to serve an obvious political agenda.